Bye-bye Baby! Hello 70 points! Today I got a little sidetracked by cars. I was working on road and pavement surfaces and thought about adding cars to the game. Or car wrecks, to be more precise. 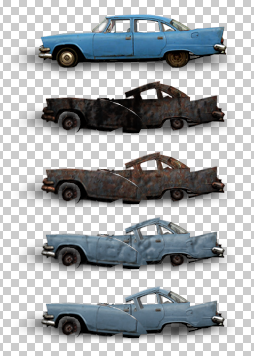 Initially I just wanted to add cars that were already wrecked, since that’s pretty easy. But then I thought it might be feasible to actually have pristine cars that would explode as the game progresses and make them part of the gameplay. So I did an experiment with a single car to see how it would go. I took a picture of a car, cut out the outline, added a shadow and dropped it on one of the new roads I had made. Then I messed up the bodywork a little bit and removed the wheels. After that I added several layers of textures that made it look broken and burnt. I think it turned out pretty well for a 30 minute experiment so I might be adding destructible cars to the game after all, although I’m not going to use this particular one because of the angle of the photo.